Barcelona clung on for a hard-fought win over Real Valladolid, who had an injury-time equaliser ruled out after a video assistant referee review. VAR was only introduced to La Liga this season and it was used to show that Keko's diving header was offside. The decision denied newly promoted Valladolid a second point from two league matches. Ousmane Dembele scored a second-half winner after Sergi Roberto had kept the ball in with a header on the byeline. Luis Suarez also had a goal ruled out for offside with 10 minutes remaining. 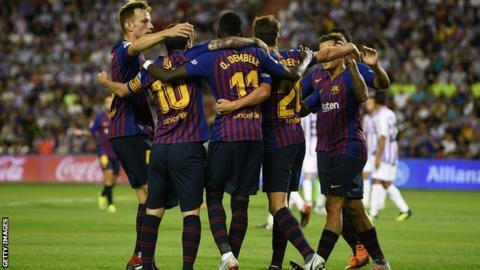 Barcelona began the defence of their league title with a 3-0 win over Alaves last weekend but were fortunate to see out victory over Valladolid - who finished fifth in Spain's second tier last season. Goalkeeper Jordi Masip made two impressive saves from Suarez and Philippe Coutinho before the break and former Manchester City forward Enes Unal was a constant threat. The 21-year-old had an effort tipped over the bar in the first half and Keko came close to equalising with another header after the break. The recently laid pitch hindered both sides, with large divots appearing throughout the match which forced players to attempt to replace patches of turf in an attempt to make it smoother. The hosts delivered a crushing blow to Barcelona's title hopes when they last played at the Estadio Jose Zorrilla four years ago, winning 1-0 against a team including Lionel Messi, Neymar and Cesc Fabregas. Match ends, Real Valladolid 0, Barcelona 1. Second Half ends, Real Valladolid 0, Barcelona 1. Offside, Real Valladolid. Fernando Calero tries a through ball, but Keko is caught offside. Attempt missed. Rubén Alcaraz (Real Valladolid) right footed shot from outside the box is close, but misses the top left corner. Assisted by Javi Moyano. Attempt saved. Malcom (Barcelona) left footed shot from the left side of the box is saved in the centre of the goal. Assisted by Arturo Vidal with a headed pass. Hand ball by Keko (Real Valladolid). Offside, Barcelona. Lionel Messi tries a through ball, but Luis Suárez is caught offside. Corner, Barcelona. Conceded by Keko. Attempt saved. Kiko Olivas (Real Valladolid) header from the centre of the box is saved in the bottom left corner. Assisted by Óscar Plano with a cross. Attempt saved. Keko (Real Valladolid) header from the centre of the box is saved in the centre of the goal. Assisted by Duje Cop with a cross. Substitution, Barcelona. Arturo Vidal replaces Ousmane Dembélé. Corner, Real Valladolid. Conceded by Samuel Umtiti. Hand ball by Nacho (Real Valladolid). Keko (Real Valladolid) wins a free kick in the defensive half. Substitution, Real Valladolid. Duje Cop replaces Enes Ünal. Attempt missed. Óscar Plano (Real Valladolid) right footed shot from outside the box misses to the right. Assisted by Enes Ünal following a corner. Toni Villa (Real Valladolid) wins a free kick in the defensive half. Substitution, Real Valladolid. Keko replaces Borja Fernández. Sergio Busquets (Barcelona) wins a free kick on the left wing. Gerard Piqué (Barcelona) is shown the yellow card for a bad foul. Goal! Real Valladolid 0, Barcelona 1. Ousmane Dembélé (Barcelona) right footed shot from the centre of the box to the bottom left corner. Assisted by Sergi Roberto with a headed pass. Foul by Javi Moyano (Real Valladolid).